VIPAccessEXCLUSIVE: Alexisjoyvipaccess Covers The Inspiring And Spectacular 2016 Nickelodeon HALO Awards – RECAP Here! It honors several, admirable teens who are doing above and beyond to help make the world a better place to live in. It encourages everyone that your actions can help impact the lives of many, and you too, can always “Help And Lead Others.” It also brings together some of the greatest musical acts to ever walk this planet and it brings all of these magnificent things together for one unforgettable night. It is the Nickelodeon HALO Awards – one of the most influential, inspiring, and life-changing award shows there is. Each year, Nickelodeon, along with creator, host, and executive producer of the Nickelodeon HALO Awards, the iconic, legendary, and prolific Nick Cannon, brings out one of the most spectacular award shows which celebrates a few of the many marvelous teens who are changing the world for the better. This year, the 2016 Nickelodeon HALO Awards will be leaving you in awe and absolutely mesmerized yet again as it airs on Sunday, November 27th at 7:00 PM ET / PT – perfect timing for Thanksgiving when we all can continue to show our gratitude and thanks over everything and take the extra step to give back to others. The 2016 Nickelodeon HALO Awards had its special taping on Friday, November 11, 2016 at the Pier 36 in New York City, New York and the night was nothing short of incredible. The outstanding award show was hosted by the stupendous Nick Cannon as he honored four, terrific teens for their efforts in Helping And Leading Others. The remarkable teens honored at this year’s award show were Grace Callwood, Jonas Corona, Lillian Pravda, and Chris Suggs. These four teens, along with many others as featured in Nickelodeon’s wonderful series, “The HALO Effect,” are changing lives and bringing hope and help to individuals, and they continue to motivate others to reach out a helping hand and bring out an act of kindness daily. The award show also had many brilliant and sensational performances from some of the biggest musical acts. The one and only Jason Derulo brought his exceptional energy and chart-topping songs to the stage as he performed a medley of his hit songs. Jason Derulo certainly got everyone up on their feet and ready for an amazing night. Other extraordinary performances included Hailee Steinfeld jamming out on stage with Zedd as she performed her fantastic song “Starving” – one of everyone’s favorite songs ever! The phenomenal Daya brought even more girl-power to the stage with her performance of her awesome song, “Sit Still, Look Pretty,” – a terrific song that inspires everyone to follow after their dreams and it continues to showcase how much of a head-strong, classy, and respectable artist Daya is. The immensely talented Alessia Cara performed her awesome song “Scars To Your Beautiful” that encourages self love and motivates fans to be confident in themselves. Alessia Cara continues to be such a down-to-earth individual who is beautiful both inside and out. In addition, singing sensations Jake Miller and Jacob Whitesides made a special appearance at the renowned award show. Not only are Jacob Whitesides and Jake Miller some of the most talented and gifted musicians, but they both are so incredibly humble and they, along with all of the performers and attendees of the HALO Awards, deserve all of their successes. Multi-threat: actress, singer, and dancer, JoJo Siwa also performed her viral, anti-bullying song, “Boomerang” at the event. Many Nickelodeon stars came out to show their support towards the fabulous award show including the cast of Nickelodeon’s music-filled show, “School Of Rock” with cast-members Breanna Yde, Ricardo Hurtado, Aidan Miner, Lance Lim, and Jade Pettyjohn in attendance. Real-life superheroes Kira Kosarin and Jack Griffo from “The Thundermans” were also at this year’s Nickelodeon HALO Awards and the lovely Isabela Moner of “Legends of the Hidden Temple” (premiering on November 26th) was in attendance at the event. Nickelodeon stars took part in special arcade game challenges to help raise money for the organizations of the HALO Award honorees. Other amazing celebrities came out to the Big Apple to celebrate the outstanding award show including Chloe Lukasiak, Loren Gray, AJ Lehrman, Carson Lueders, Johnny Orlando, and many, many more. Words fall short when describing how superb and spectacular of an award show the Nickelodeon HALO Awards are. It’s not just an award show, but it’s one that this world truly needs – it’s an award show that brings positivity and love to this world and whether you are attending the HALO Awards in person or tuning in to watch the award show on TV, you will feel oh, so happy with how this award show promotes kindness and helping out others. It’s the only award show of its kind and it’s only on the stupendous Nickelodeon. 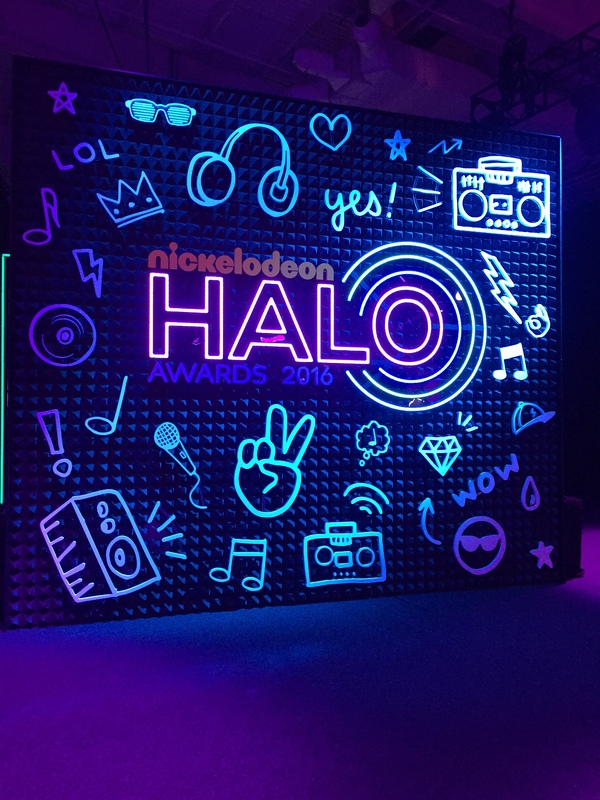 I, Alexisjoyvipaccess had the greatest, greatest honor of covering and attending the 2016 Nickelodeon HALO Awards for the third year in a row. Check out some VIPAccessEXCLUSIVE photos I took from my coverage of the event below and stay tuned on YouTube.com/alexisjoyvipaccess for interviews with your favorite celebs from the event. Together we can change the world! Don’t forget to get your friends and family members together and prepare to be inspired by tuning in to the 2016 Nickelodeon HALO Awards on Sunday, November 27th at 7:00 PM ET / PT. Also, take a look below to see what this year’s HALO Award honorees have accomplished. Follow Nickelodeon on Twitter: @NickelodeonTV and @NickelodeonHALO and join in on the conversation by using #HALOAwards! Lillian Pravda, 16, New York, N.Y.– After undergoing several surgeries to correct a cataract, Lillian Pravda learned that not every child in need of eye care is able to receive it. Pravda initially started Vision for and from Children to help comfort young patients in a pediatric surgical unit, but soon grew it into an organization that supports children across the globe by providing access to sight-saving surgeries and vision services. Previous VIPAccessEXCLUSIVE: Alexisjoyvipaccess Attends Lucky Blue Smith’s Breathtaking “Love Everlasting” Movie Premiere – Recap Here! Next VIPAccessEXCLUSIVE: Alexisjoyvipaccess Covers MTV’s Extraordinary “Teen Wolf” And “Sweet / Vicious” Premiere Party! Tune In Tonight At 9:00 PM!